Whether it’s a beer or a partner who hangs around because you’ve got money, it’s not a good thing to be a gold digger. While I’m no fan of people who hook up for the cash money, I actually like the beer version of the Gold Digger. Now, that will cause a sharp intake of breath from some in the good beer community because, you see, Gold Digger is what is derisively referred to as ‘‘supermarket beer’’. It’s a beer that is part of a range notionally brewed by Steamrail – which is essentially owned by Coles. The (not really a) brewing company popped up not long after Woolworths created its own (not really a) brewing company called Sail & Anchor. Some beer geeks hate them both – not because the beer isn’t any good but simply because they don’t like the idea of a big company trying to push its way into the ‘‘craft beer’’ market. I can see their point of view – as long as they dis the companies and not the beer (it’s just wrong to criticise a beer you won’t drink on principal for being crap. If you’re not drinking it, how do you know what it tastes like?). But I don’t worry too much about who owns a beer; I focus more on what it tastes like. I try and avoid the ‘‘craft beer/mainstream beer’’ divide, instead breaking it down to categories of ‘‘good beer’’ and ‘‘bad beer’’. As it so happens, the ‘‘good beer’’ and ‘‘craft beer’’ categories do substantially cover the same ground. Though some things do slip through – like Sail & Anchor’s imperial stout (who would that be made for if not beer geeks?). 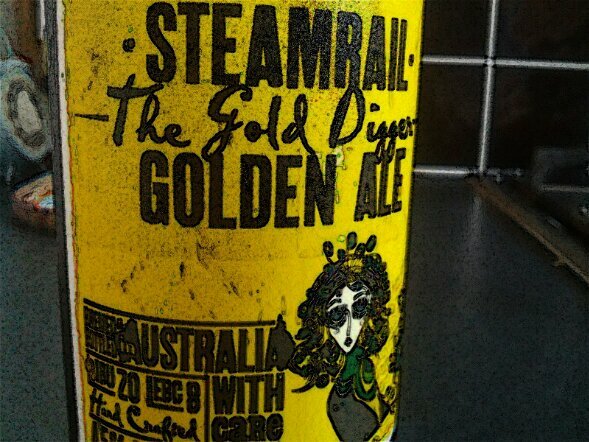 And the Gold Digger from Steamrail. I like this baby because it’s got some flavour. It’s a golden ale and, in my experience, so many golden ales taste pretty bland to me (hello, James Squire). The flavour is light and citrussy and it goes down a treat. It’s a tasty lawnmower beer – which is quite apt really given that some believe Steamrail is cutting other people’s grass.